On Sunday October 13, 2013, I traveled down south with Wu Lihong to visit and interview families of Tiananmen victims. The interviews started in Guangzhou. The first family is from Guangzhou's Huadu District. This is the present home of the parents of Tian Daoming (田道明), a June Fourth victim. They originally lived in Lilinzui Village, Gaoling Township, Shishou City, Hubei Province. 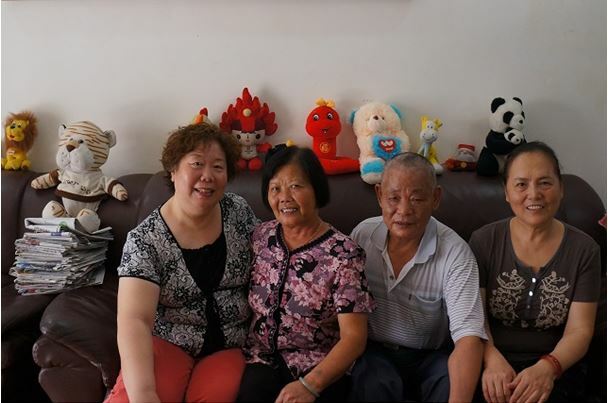 His parents, Tian Weiyan and Huang Dingying, now live with their younger son’s family in Guangzhou. It’s been more than 24 years since the great massacre of June Fourth. His parents are now elderly. And in this time, the government has tried every way to block the truth about June Fourth, and never mentioned their crimes during the crackdown while extoling their glorious achievements governing the country. With the passage of time, the truth of June Fourth will gradually fade from the view of the Chinese people. But will time really erase our memories? We bought high-speed train tickets from Beijing to Guangzhou. After we arrived at the South Railway Station, we headed directly to our destination by subway. We had never met Mr.Tian Weiyan, his wife, or his younger son. Walking out of the subway, we saw a woman in a collarless short-sleeve shirt with a purple flower pattern and black pants walk toward us. Next to her were an elderly man and a younger man. She asked Wu Lihong if we were from Beijing. “Yes. You must be Huang Dingying?” I knew that they must be Tian Weiyan and his wife and their younger son. They accompanied us to our hotel. We put away our luggage, took off our fall-weather clothes from Beijing and changed into summer clothes. October in Beijing is already autumn. But it is still very hot in Guangzhou. The weather is more like that in Beijing in early September. Wu Lihong and I talked about how our husbands were shot to death at that time. It was getting late. We agreed to visit their home at around 9:30 the following morning. The next day, we took a bus to Tea Garden Farm as scheduled. Before getting off the bus, we already saw Huang Dingying waiting at the stop. The residential area is not far from the bus stop. After reaching an intersection, we made a turn. After walking for about 100 meters, we arrived at the entrance of the residential area, where Mr. Tian was waiting. From left: Wu Lihong, Huang Dingying, Tian Weiyan, You Weijie. Tian Weiyan is 72 years old. Huang Dingying is 68. In their hometown in Hubei, when their children were young, they farmed to raise the family. But their harvest every year did not bring in much money. During slack seasons, Tian Weiyan took temporary jobs to help make ends meet. The Tians have five children. The oldest is a girl. The second was their son Tian Daoming who was killed during the June Fourth massacre. The third and fourth are girls. The fifth is a boy. Their three daughters are all married and live in different places. Their younger son graduated from Xiamen University, majoring in finance and economics. He currently works at a power company. He is a loving son, knowing very well how hard his parents’ life has been. He knew that his brother was killed in Beijing. Though he didn’t know much in those days, as he was very young, he witnessed the pain his parents suffered from losing a son. His mother had a nervous breakdown and was hospitalized twice. His father, enduring his pain, worked hard everywhere to support the family. It was in those days that he was determined to have his parents live with him once he had a job so that they could enjoy their remaining years. 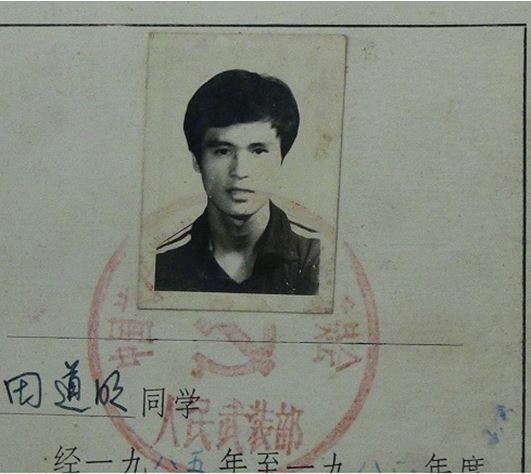 After graduating in 1998, he had his parents move in with him, moving from Hubei to Guangzhou in 1999. They have lived together ever since. We told them why we were there. The June Fourth massacre happened 24 years earlier. It will be the 25th anniversary next year. We, families of victims in Beijing, have always been concerned about families of victims outside of Beijing. We don’t know how you have lived in the past two decades. So we are here today to see you and to hear your thoughts. We will continue to pursue the Communist Party and the Chinese government and ask them to take responsibility for the massacre. The Tians start to talk about how Tian Daoming was crushed to death by the tank on that day. Tian Daoming was 22 years old when he was killed. He was a fourth-year student at the university, scheduled to graduate the following month. He was crushed to death by a tank at Liubukou in the early morning of June 4. The school notified the family in a telegram. For the parents, it was like a bolt of thunder from a clear sky, like the sky was collapsing upon them. They couldn’t make the trip to the capital, and asked their two nephews, 36 and 25, to handle their son’s funeral in Beijing. The nephews told them what happened when they return from Beijing. On June 3, Tian Daoming worked on his graduation thesis. He finished dinner after 5 p.m. Three schoolmates from a different class saw him and asked: “Tian Daoming, why didn’t you go to Tiananmen Square today? The government didn’t agree to a dialogue previously, but we heard that they will grant us a dialogue tonight. Let’s go together.” So they went together. Tian Daoming’s military training card photo. Tian Daoming with his classmates. 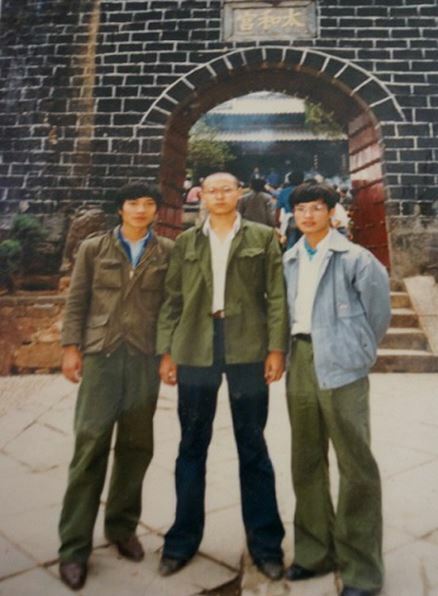 Tian’s school mates told Tian Weiyan’s nephews that on their way to Tiananmen Square, the troops had already started shooting. Tian Daoming and other students all joined in helping the wounded students and residents. During the clearing of the square in the early morning of June 4, students withdrew from the square, four in a row, towards West Chang’an Avenue. They encountered the troops when they arrived at Liubukou. To protect students, Beijing residents got on their knees in front of the tanks to block the troops. The troops shot poisonous tear gas into the crowd, making students and residents fall to the ground. Then a row of tanks rolled over the unconscious people. Tian Daoming was among them. Half of Tian Daoming’s forehead and one eye were crushed by a tank. What was left was the other half of his forehead and one eye. He had no other injuries on his body. He died instantly. One of his schoolmates fainted, but fortunately he fell on the toppled railing outside the street curb. He lost one tooth, but lived to tell Tian’s nephews what had happened at the scene. To get to the dead bodies of the students, many Beijing residents were either injured or killed by the strafe of machine guns. The blood on the ground was so thick it was hard to wash away. It was near noon. Tian Weiyan had to leave. We continued to talk with Huang Dingying. The school’s opinion then was that he was accidentally killed. So the school gave the nephews 1,000 yuan to bring home. Upon learning that Tian Daoming’s family had a hard life, his classmates each donated 10 yuan to Tian’s parents as the education fee for their younger son. In those days, their younger son was in middle school. They also sent him clothes like overalls. Because they participated in the student movement, Tian Daoming’s classmates were not assigned good jobs. They gradually lost contact with each other. Tian Daoming’s ashes were buried in their hometown―Gaoling Township, Shishou City, Hubei Province. Tian Daoming’s student ID, residence ID, and clothes were burned with him in accordance with their hometown custom. Nowadays, the parents don’t return to their hometown much anymore. They have given their house and land to their relatives. Their son was wrongfully killed more than two decades ago. In the first few years, the Tians washed their faces with tears every day. Tian Daoming’s father cried in the fields every day when working on the farm. His mother didn’t come out of her depression for a long time. She was even treated in a psychiatric hospital. For all these years, there wasn't a day that they didn’t think of their son. The Tians reiterated their hope that they would live to the day when the government would give a fair and just resolution to the June Fourth massacre and expose the truth about the shootings. “There is law in China. Our children must not just die like that. The central government must not continue to evade it anymore. They must give us an explanation,” they said. You Weijie (尤维洁) and Wu Lihong (吴丽虹) are members of the Tiananmen Mothers. Tian Daoming (田道明), 22, male, a senior at the Department of Management of the University of Science and Technology Beijing. Crushed to death by a tank in the early morning of June 4, 1989. Originally from Shishou City, Hubei Province.